Thedesignconcept introduced stimulating and inspirational furniture, gadget bars and digital technology to this exciting library space. A bank of PC’s are readily available for public use to access the internet, a gadget bar provides charging facilities for phones and laptops in the ‘quiet’ study area in the library. Teenagers can enjoy an area fitted with games consoles, large screens and innovative furniture for ultimate comfort. Throughout the library, digital end-panels allow customers to browse for specific books and authors as well as giving access to the library’s app which highlights new books and facilities that are available for each customer. 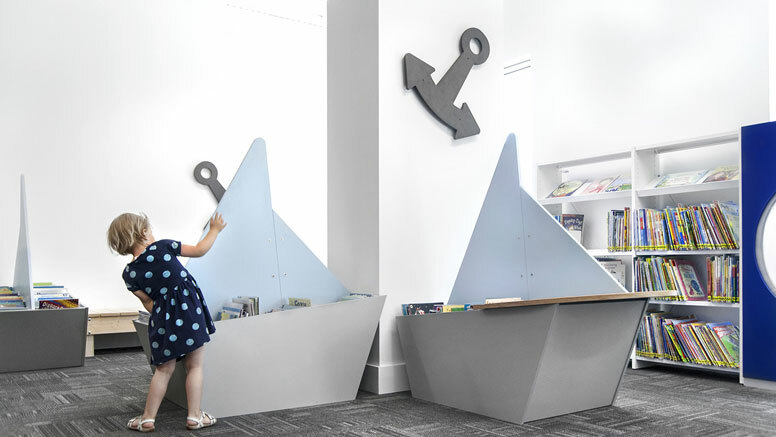 Following a maritime theme, to incorporate the rich history of Greenwich, the children’s area of the library has been fitted with boat shaped browsers and the shelving includes waves, anchors and port-holes for children to enjoy. The children’s library also has PC’s and tablets available for the younger visitors. Each area of the library is clearly defined to allow multi-purpose use for all ages and to encourage the local community’s creativity to flourish. Customers have access to a world of technology to advance their skills and knowledge in a variety of ways. Take a virtual tour with Google Indoor Maps.